Naturally, we need to be mindful of all factors - but, specifically, the greater risk posed by the human factor. You may remember an NHS project called the National Programme for IT that kicked off in 2002. Its intention was to transfer all NHS records into a central digital hub by 2018. Poor negotiating capability, resulting in deals which were poor value for money - and weak program management and oversight. These problems were directly related to the people behind the program. I’ll draw on my battle-tested experience of working with companies on what needs to shift to get better business results from their change initiatives - whether the initiative is a merger, acquisition, new technology introduction - or a business model transformation. My focus has been in dealing with the flaws and challenges in program delivery – and, here, we help clients to set up powerful, custom-built, execution-frameworks that gets them the results they need. Normally after a bad board meeting, Mentor would step in at the brink of program collapse and work with clients to salvage a program when things have gone wrong. Of course, people – program visionaries, planners and deliverers - are the lifeblood of any project. But, as the ‘imperfect humans’ we all are, the human factor is clearly something we can’t skate around. No matter how much we’d like to. On change programs, typically the same kind of problems crop up - time and time again. The problems always relate to the complex interrelationship between people and undercurrents in team working. They’re so often glossed over at the outset of any large change initiative - but people are indispensable to successful change. Taking a look at another high-profile failed program that went badly wrong, illustrates the destructive power of people. A BBC project called the Digital Media Initiative was scarily similar to the NHS IT example I referred to earlier. It neatly demonstrates the difficulty of going digital at scale. Launched in 2008, its aim was to digitise the huge amounts of videotape in the BBC archives. Initially, the BBC brought in a well-known technology company to help them with the task. However, after a series of broken promises, missed deadlines and rising costs, the BBC decided to get rid of the subcontractor and bring the project back in house. This proved a grave mistake. (It usually is). The BBC was too complacent about risks. No single individual had overall responsibility or accountability. No one took ownership of problems. Worse, the Corporation failed to respond to warning signals – hiding in plain sight - that the program was in trouble. I have an example of my own to add. It’s just one of many stories I could tell you about people (in this case me) getting in the way of success on change initiatives. Years ago, I worked for a technology company with a ‘can do’ culture – and I was sent overseas to rescue a program that had gone badly off the rails. When I arrived, I was met with misleading, anorexic plans; progress reports that were little more than fairy-stories. No one outside the program knew what a shambles it was – except me. I should have blown the whistle immediately but was worried about being seen as a ‘loser’ in HQ. So, I got carried away with the company’s ‘can-do’ attitude and tried to fix it. This meant months of putting a positive spin on what was essentially terrible news. I caught a really bad dose of Pinocchio Syndrome. Eventually, I decided to come clean and told management they should cancel the program. It didn’t go down well. Everything I thought would happen did. I was removed from my job – and seen as a loser. But in the end they agreed with me – 5 months later - but it was a hard lesson. Sometimes you have to stand up to the big boys. You have to speak up – and even be blunt. So, it’s fairly clear, people’s conduct is at the heart of many high-profile and large-scale failures, most of which have monumental financial consequences. The problems we face, however, don’t have to be high-profile - or even large-scale - to prove an obstacle to successful change. All it takes is one or two people-related problems to make our jobs as change agents much more difficult. Let’s look at some of the people-related problems we need to look out for when we’re aiming to facilitate successful change. It’s not pretty reading, but any one of these can slow a change program down – or, worse, stop it in its tracks. I’m sure many, if not all of these, will be familiar to you. Assuming the business is very clear on the change it wants to make - you’ll notice there are three main offenders looming larger than the rest. These are the three biggest - and most damaging threats - to successful change as I see it. Most program post-mortems tend to highlight these problems. 1. A lack of alignment – a disjointed executive team, all pulling in different directions, with no shared vision of the change. 2. A lack of focus – program deliverers distracted by conflicting priorities and responsibilities - leading to poor time and resource management. 3. A lack of realism - a naïve vision from the top that isn’t fully formed or researched and is ultimately unattainable. How can we tone down these three threats to successful change - during the program set-up? It need not be complicated – just flip them on their heads. Look at them from the other side and make sure the missing elements we’ve identified are absolutely solid - before we embark on a change program. At Mentor, we call it the ‘missing link’. Closing the chasm between strategy and program execution - before it becomes fertile ground for a struggling program? Alignment is binary. Your team is aligned – or it’s not. No caveats. The entire executive team must share a common view of the change, understand the reasons for the change - and share a collective accountability for seeing the program through. Everyone must visibly commit their organisations to deliver the change. Focus is about directing more energy into fewer programs. A very serious point. It’s not unusual to find over a hundred (100) projects supporting a change program – large and small - each being managed in the same way. A ridiculous number – a ridiculous overhead. Where’s the focus in that? Make sure the leadership team - who have to execute the change program - has the time, resources and headspace they need to do a good job. They must be freed from their other responsibilities throughout the process. Targets are not plans, and those at the top must understand the difference. And it’s not always obvious they do. We must make sure the change the organisation wants to make - is actually practical. Don’t allow plans that assume nothing will go wrong. Make sure the execution strategy has sufficient surge capacity in it to allow for unexpected - yet inevitable problems and delays. By spending time getting things on a solid footing during the set-up phase, we can prevent human-related problems like these from occurring at all. There is a need to be acutely aware of these hazards and work with stakeholders to provide a solid framework for overcoming them - before a change program starts. A fundamental part of our role is to deal with problems that affect the survival and prosperity of the businesses we work with and how they approach major change. A large part of that - arguably the most important part - is assessing the readiness for change, in terms of the human dimension. In addition to these threats, as agents of change we should also tackle stakeholder conflict and lack of honesty to secure success. How should we combat stakeholder conflict? There are a wide range of stakeholders in an organisation from regulators, to the board of directors, the program boards, steering committees and the wider management team. It is essential that we ask ourselves …..
What is important to each stakeholder? We need to imagine how the people involved may feel about it - based on their own interests, focus and concerns and how could this change initiative create friction and discord between them. We encourage conflicting stakeholders to embrace evidence-based, rather than opinion-based, dialogue. Opinions are more common. Facts are harder to come by. Indisputable facts are just that – they destroy groundless and often prejudiced opinion. And it doesn’t matter where these facts come from – they can come from the most junior person in the room. Facts are a great leveller – and always provide a more stable foundation - than opinion - for any change program. They also create a setting in which anyone on the team can put them forward. How can we challenge a lack of honesty? Dishonesty – bending the truth - is strongly linked to an unhealthy organisational culture. This is one I’m sure we’ve all come across. Where company culture is based on fear or blame, the pressure to project an image of success stops program managers being completely honest about a program’s progress - or the lack of it. But not all cultures that supress honesty are fear-based. Some companies brag about their positive ‘can-do’ approach - but that too can handicap their change initiatives - if they regularly close their ears to an honest voice. Anyone who doesn’t ‘play the game’ can be pulled to pieces - for being ‘cynical’ or for not being ‘a team player’. When we come across dishonesty, we must ask ourselves - ‘What’s stopping people telling the truth here?’ If people are covering their backs, there must be a reason. Instead of looking at the human element as ‘a fire to be fought’ midway through a struggling change program we critically examine a program’s vital set-up phase - to resolve issues of human complexity and team dynamics - before execution begins. With the right preparation, the regular pitfalls that seem to go hand-in-hand with the human effect can - and should be - side-stepped. Eight times out of ten we get involved with a program on a ‘salvage’ basis. We have to pull together a full picture of what’s gone off-beam before we can recommend how to make it right. Truly effective change management should strive to prevent people-related problems ever becoming an issue in the first place. The crucial program set-up phase. What if - rather than focusing on a ‘post-mortem’ approach – where we rake over the bones of failure and try, in vain, to salvage the initial objective. What if we could treat our initial auditing process more like a ‘pre-mortem’? We never get another ‘blank sheet’ – a chance to start a program again from scratch. Once things have started to go out-of-kilter, no contingency plan can ever get back to the original target. Program Setup - done properly, is an enormous opportunity for companies to really drive high performance on a program. Think of it like a ‘pre-flight checklist’. No Pilot would dream of taking off without running through an exhaustive list of tests, assessments and safeguards - each and every time they fly. I believe program execution is no different – and while a pre-mortem process is easy to describe and understand - many companies also find it easy NOT to do. We can prevent fatal program issues from being ‘baked in’ from the outset, by taking the time to iron out wrinkles - in the human factor - that can cause problems downstream. People who can challenge current practice - and be a catalyst for improving business performance, enable the organisation as a whole to achieve its strategic objectives and realise value from major transformations. But let’s not wait until human dimension issues throttle a change program’s progress - midway through. Let’s use our hard-earned experience in the human factor to head off potential problems - and recommend crucial improvements - before a change program gets underway. This is perhaps one of the best ways of adding value to an organisation - and goes a long way towards bringing about long-term and sustainable transformation. As change agents, our job to keep our organisations continually moving forward, promoting better ways to do things wherever we can - and offering a guiding hand to the process of implementing these changes. This is never more essential than when it involves people. People are both the initiators - and the unwitting saboteurs of successful change – they are our most valuable asset - but also the most potentially disruptive. Are we agents of positive change or guardians of the status quo? It’s up to us to detect and head off the problems they can cause - and steer our organisations through choppy waters to new standards of excellence and success. Models for change management highlight the key elements of successful change – strategy, process, technology and of course, people. Most of them suggest these factors are equally important but I believe that the impact of people dwarfs the other dimensions. Naturally, we need to be mindful of all factors – but, specifically, the greater risk posed by the human factor. Poor negotiating capability, resulting in deals which were poor value for money – and weak program management and oversight. I’ll draw on my battle-tested experience of working with companies on what needs to shift to get better business results from their change initiatives – whether the initiative is a merger, acquisition, new technology introduction – or a business model transformation. My focus has been in dealing with the flaws and challenges in program delivery – and, here, we help clients to set up powerful, custom-built, execution-frameworks that gets them the results they need. Of course, people – program visionaries, planners and deliverers – are the lifeblood of any project. But, as the ‘imperfect humans’ we all are, the human factor is clearly something we can’t skate around. On change programs, typically the same kind of problems crop up – time and time again. The problems always relate to the complex interrelationship between people and undercurrents in team working. They’re so often glossed over at the outset of any large change initiative – but people are indispensable to successful change. Worse, the Corporation failed to respond to warning signals – hiding in plain sight – that the program was in trouble. Eventually, I decided to come clean and told management they should cancel the program. It didn’t go down well. Everything I thought would happen did. I was removed from my job – and seen as a loser. But in the end they agreed with me – 5 months later – but it was a hard lesson. So, it’s fairly clear, people’s conduct is at the heart of many high-profile and large-scale failures, most of which have monumental financial consequences. The problems we face, however, don’t have to be high-profile – or even large-scale – to prove an obstacle to successful change. All it takes is one or two people-related problems to make our jobs as change agents much more difficult. I’m sure many, if not all of these, will be familiar to you. Assuming the business is very clear on the change it wants to make – you’ll notice there are three main offenders looming larger than the rest. These are the three biggest – and most damaging threats – to successful change as I see it. Most program post-mortems tend to highlight these problems. 2. A lack of focus – program deliverers distracted by conflicting priorities and responsibilities – leading to poor time and resource management. 3. A lack of realism – a naïve vision from the top that isn’t fully formed or researched and is ultimately unattainable. How can we tone down these three threats to successful change – during the program set-up? It need not be complicated – just flip them on their heads. Look at them from the other side and make sure the missing elements we’ve identified are absolutely solid – before we embark on a change program. At Mentor, we call it the ‘missing link’. Closing the chasm between strategy and program execution – before it becomes fertile ground for a struggling program? Alignment is binary. Your team is aligned – or it’s not. No caveats. The entire executive team must share a common view of the change, understand the reasons for the change – and share a collective accountability for seeing the program through. Focus is about directing more energy into fewer programs. A very serious point. It’s not unusual to find over a hundred (100) projects supporting a change program – large and small – each being managed in the same way. Make sure the leadership team – who have to execute the change program – has the time, resources and headspace they need to do a good job. They must be freed from their other responsibilities throughout the process. Targets are not plans, and those at the top must understand the difference. And it’s not always obvious they do. We must make sure the change the organisation wants to make – is actually practical. Don’t allow plans that assume nothing will go wrong. Make sure the execution strategy has sufficient surge capacity in it to allow for unexpected – yet inevitable problems and delays. There is a need to be acutely aware of these hazards and work with stakeholders to provide a solid framework for overcoming them – before a change program starts. A fundamental part of our role is to deal with problems that affect the survival and prosperity of the businesses we work with and how they approach major change. A large part of that – arguably the most important part – is assessing the readiness for change, in terms of the human dimension. We need to imagine how the people involved may feel about it – based on their own interests, focus and concerns and how could this change initiative create friction and discord between them. Facts are a great leveller – and always provide a more stable foundation – than opinion – for any change program. They also create a setting in which anyone on the team can put them forward. Dishonesty – bending the truth – is strongly linked to an unhealthy organisational culture. Where company culture is based on fear or blame, the pressure to project an image of success stops program managers being completely honest about a program’s progress – or the lack of it. But not all cultures that supress honesty are fear-based. Some companies brag about their positive ‘can-do’ approach – but that too can handicap their change initiatives – if they regularly close their ears to an honest voice. Anyone who doesn’t ‘play the game’ can be pulled to pieces – for being ‘cynical’ or for not being ‘a team player’. When we come across dishonesty, we must ask ourselves – ‘What’s stopping people telling the truth here?’ If people are covering their backs, there must be a reason. Instead of looking at the human element as ‘a fire to be fought’ midway through a struggling change program we critically examine a program’s vital set-up phase – to resolve issues of human complexity and team dynamics – before execution begins. With the right preparation, the regular pitfalls that seem to go hand-in-hand with the human effect can – and should be – side-stepped. What if – rather than focusing on a ‘post-mortem’ approach – where we rake over the bones of failure and try, in vain, to salvage the initial objective. What if we could treat our initial auditing process more like a ‘pre-mortem’? Program Setup – done properly, is an enormous opportunity for companies to really drive high performance on a program. Think of it like a ‘pre-flight checklist’. No Pilot would dream of taking off without running through an exhaustive list of tests, assessments and safeguards – each and every time they fly. I believe program execution is no different – and while a pre-mortem process is easy to describe and understand – many companies also find it easy NOT to do. We can prevent fatal program issues from being ‘baked in’ from the outset, by taking the time to iron out wrinkles – in the human factor – that can cause problems downstream. People who can challenge current practice – and be a catalyst for improving business performance, enable the organisation as a whole to achieve its strategic objectives and realise value from major transformations. But let’s not wait until human dimension issues throttle a change program’s progress – midway through. Let’s use our hard-earned experience in the human factor to head off potential problems – and recommend crucial improvements – before a change program gets underway. This is perhaps one of the best ways of adding value to an organisation – and goes a long way towards bringing about long-term and sustainable transformation. As change agents, our job to keep our organisations continually moving forward, promoting better ways to do things wherever we can – and offering a guiding hand to the process of implementing these changes. People are both the initiators – and the unwitting saboteurs of successful change – they are our most valuable asset – but also the most potentially disruptive. It’s up to us to detect and head off the problems they can cause – and steer our organisations through choppy waters to new standards of excellence and success. 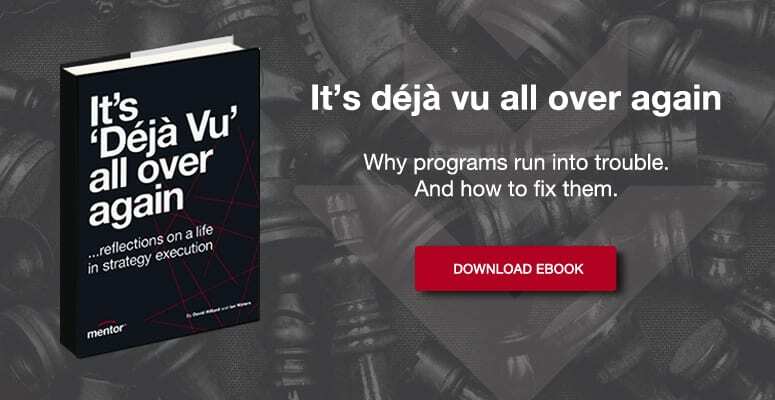 If you’d like to read more about why change programs crash, have a look at our eBook “It’s Déjà vu all over again”.